Mr. Muddassir Rizvi is the Head of Programs at TDEA, in 2007/2008, he designed and managed Pakistan’s largest domestic election observation effort, which included the country’s first valid voters’ list audit and the world’s largest set of Parallel Vote Tabulations (PVTs). Mr. Rizvi stewarded the transformation of FAFEN from an informal election monitoring network to a legal entity with exemplary organizational systems implementing $75 million of multi-dimensional governance programming. Earlier, he worked with leading NGOs such as Pattan Development Organization, the Network for Consumer Protection, and International Crisis Group (ICG). Mr. Rizvi started his career in 1992 as a journalist, including senior posts with Pakistan’s The News (News Editor) and wire service NNI (Editor). 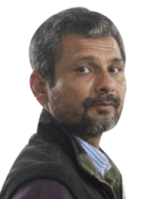 His articles and editorials have been published by The News, Inter Press Service, Himal, Newsline, Pulse, The Way Ahead, VSO’s Orbit magazine, DFID’s Developments, Multinational Monitor, Out There News, CSE’s Down to Earth, New Internationalist and Adbusters.